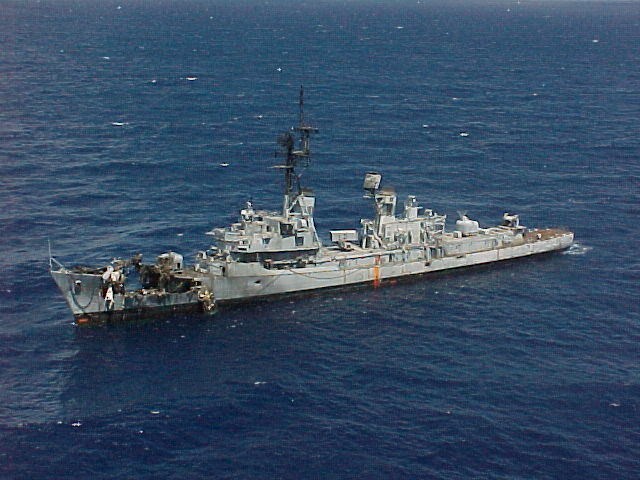 On June 13, 2000 the USS Buchanan took part in the RIMPAC 2000 as a target ship at Pacific Missile Range Facility, North of the Hawaiian Island of Kauia. 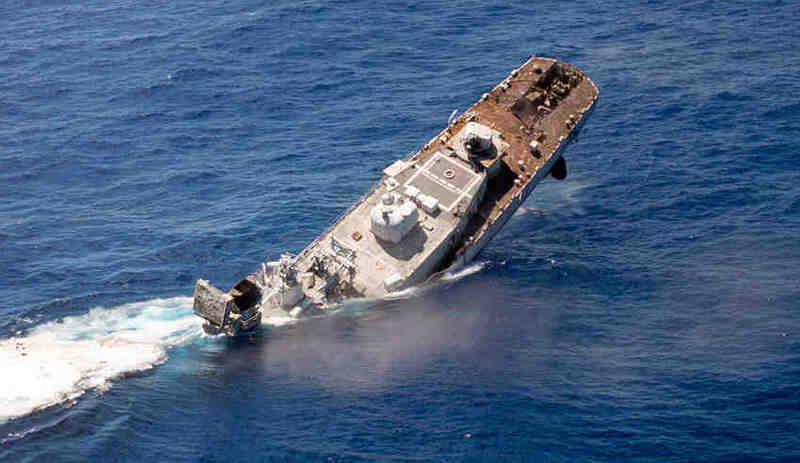 American, Canadian and Australian forces tried to sink her for more than 24 hours. She took Three hits from Hellfire missiles fired from SH-60 LAMPS helos; Three Harpoon Missiles fired from RAAF F-111 & US P-3 aircraft and several allied ships; and a GBU-24 (2400 lb laser guided) bomb. 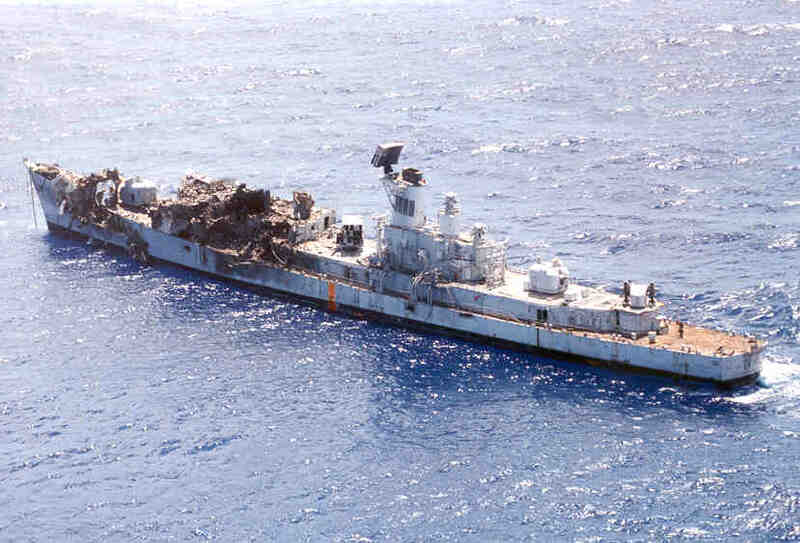 The USS Buffalo's MK-48 torpedo that was to have delivered the coup de grace malfunctioned. Buchanan stayed afloat all night. On the morning of June 14, 2000 EOD Team boarded her and placed 200 pounds of C-4 in predetermined locations. Sixteen minutes and three seconds after igniting the time fuse the Buchanan gracefully in a bow down attitude slid below the surface of the Pacific Ocean. At 21:26:30Z (11:26:30 AM HST) 14 June 2000 Davy Jones piped her aboard at her final resting place of 22:54.38N, 160:27.68W , 64 Nautical Miles from land in 2540 Fathoms of water. You know as men who have served aboard Buchanan we've always wanted the best for the ol'Gal. Ya', she was a pain some times, but she also took care of us. Warmer then I wanted in others. What do you mean "we don't have a spare"
shattered hull I must say "Dam, she's still a great looking ship"
great admiration for the survivability of the Buchanan. decent I spoke a prayer of gratefulness to God Almighty. courage to act as the men of the Buchanan. from the day her first commanding officer Cdr. David Webster (RADM David Webster) did. Some think that, wherever he is, he arranged the act and the timing. Like the Pharohs, he now has his ship to carry him across the heavens. One last time underway, without a course to steer. A final time at sea, with her very life at stake. A battle-scarred veteran, a warrior of the sea. She could feel a sense of danger, throughout her very core. She vowed to make it interesting, and not go without a fight. But without a crew to man her, she couldn't try to flee. But if they couldn't do any better, they shouldn't even try! Next came a fast Aussie, a F-111 from the " down under,"
Firing a HARPOON with only TM, is like lightning without the thunder. As inbound came the Orions, to put her on the ocean floor. Still without a mortal injury, still too proud to run. Again she shook them off, as only she could do. So next came an Aussie frigate, and they thought the war was won. Bring up the Canadian frigate, and let them try their luck. Flew through the hole of the others, as if a missile sport! Armed with a few two tonners, she hadn't come to play. And when the smoke had cleared, BUCHANAN's bridge was no more. She had taken severe damage, and sink they thought she should. But she still stood in dignity, upon an even keel. Only one card left to play, the Silent Service at its best. As she let loose a torpedo, from the dark and briny deep. The fast attack soon departed, to join the others so aggrieved. And when it was all over, she was the only one to stay. For tomorrow would bring a sunrise, EOD and scuttling gear. And she had lived as she was built, to go out in harm's way. Her heart will still beat proud, this tough and gallant lady.